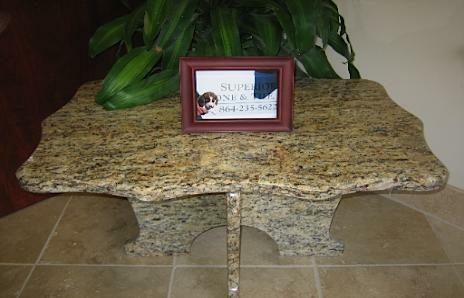 Granite tables are absolutely the most beautiful pieces of furniture you could have. We can design your table for you. Practically any size, shape and color. 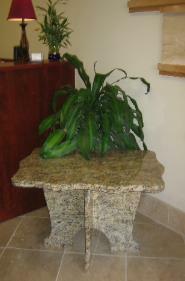 Granite has an exotic and rustic appeal and it is aesthetically pleasing. Because granite is created deep within the earth from magma, cooled slowly under enormous pressure, it has a very dense grain which makes it impervious to stains. Marble is also used to make decorative furniture and being weather resistant, it is perfect for outdoor tables, table bases and benches. Marble is porous but the pores are not visible to the naked eye, however, they are large enough to soak up moisture. If colored liquids such as grape or other dark colored juices, red wines etc. are spilled they can discolor marble. To prevent stains a surface sealer can be applied which fills the pores, making it impossible for moisture to penetrate. 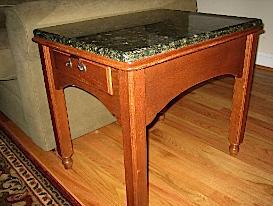 Granite tops over wooden table surfaces are a great way to save your old wooden furniture. Maybe you're thinking that old end table has had it's day and you want to toss it out. 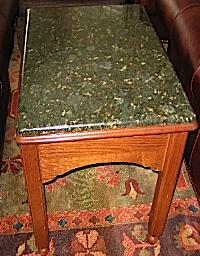 A beautiful stone table top is an easy way to make the old table look new. It's easily done in our fabrication shop and again you can choose from many colors to fit in with your decor. These are fairly old pieces of furniture and the tops are very stained and scratched so using stone tops easily remedied the problem and they look great with our sofa and chairs. 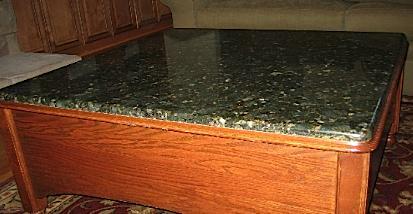 There are so many ways to utilize granite tops with wood. 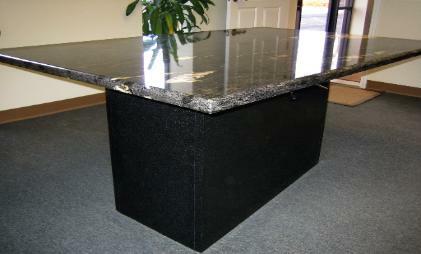 Wooden bases with granite tops or granite bases with glass table tops look gorgeous in dining rooms.